Campus security and safety is an important feature of postsecondary education. The Department of Education is committed to assisting schools in providing students nationwide a safe environment in which to learn and to keep students, parents and employees well informed about campus security. These goals were advanced by the Crime Awareness and Campus Security Act of 1990. The Department is committed to ensuring that postsecondary institutions are in full compliance with that Act, and enforcement of the Act is a priority of the Department. 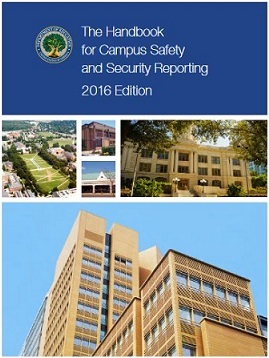 This handbook was developed by the U.S. Department of Education to present step-by-step procedures, examples, and references for higher education institutions to follow in meeting the campus safety and security requirements of the Higher Education Act of 1965, as amended. This handbook replaces the 2011 version and includes information on how institutions can comply with the changes the Violence Against Women Reauthorization Act of 2013 made to the Clery Act.